These veterans say they are doing meaningful work during their retirement through the Memorial Services Detachment. They hope to honor veterans with dignity and respect. Students from The Little Flower Catholic school were captivated by the presentation of U.S. flag history and etiquette. 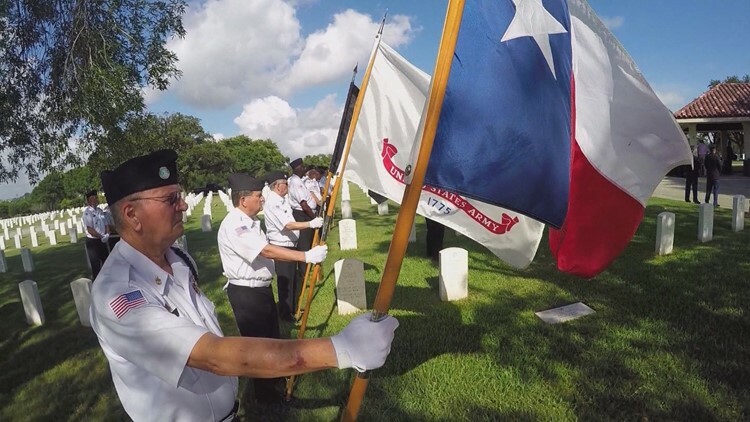 SAN ANTONIO — That grand old flag will continue to fly high in the generations to come thanks to the veterans who volunteer their time imparting wisdom into students each year. On Friday, students from The Little Flower Catholic school were captivated by the presentation of U.S. flag history and etiquette. Retired Master Sergeant Tom Ernest, 80, shared special facts he says all Americans should know about our nation's flag. Without flashing lights or fancy visuals, Ernest spoke to students for nearly an hour without losing their attention. He concluded by opening the floor for questions. Little hands shot up all over the room and questions poured in about everything from wars fought to how to properly fold the flag. "Today, I learned how important [Veterans Day] is to other people, and I learned how important is to me since I have a veteran that is my dad," said Michael Castillo, student. "I should be proud." Principal Jackie Castro explained how important it is that students understand the sacrifice our nation's veterans have made. "We owe it to them since they gave up their time and their families to defend us," she said. "Freedom is not free so we have to celebrate and honor our veterans." The assembly ended with a chorus of high pitched voices proudly belting out Lee Greenwood's "God Bless the U.S.A." Students showed their appreciation to all the veterans present by giving them thank you cards, hugs, and handshakes.